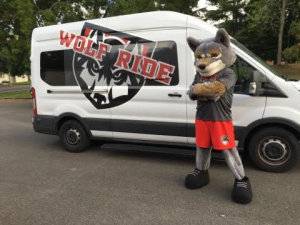 WOU’s Safe Ride Program (WOLF Ride) has one (1) van that may be used by campus affiliated groups during times that WOLF Ride is not providing service. The van is equipped with a rear-wheelchair lift making it wheelchair-friendly and suitable for 8-passengers. If the lift will not be needed, the van can accommodate 12-passengers. $40.00 per day plus fuel for use of the van will be charged. Payment will be made by a WOU Journal Voucher at the end of each academic term. Reservations are subject to availability. Reservations that interrupt or delay regular WOLF Ride service may not be approved. Reservations are on a first come, first serve basis. Reservations will be confirmed via email. Form to request use of the 12-passenger van (WOLF Ride vehicle) by a WOU department, club, or organization. Drivers must be cleared to drive a publicly-owned vehicle and have current van safety certification. Let us know if you will be using the wheelchair lift. Let us know if you need instruction on operation and use of the wheelchair lift. Keys will be picked up at the Office of the Vice President for Student Affairs, WUC Room 203, before 5:00 p.m. Monday through Friday. If travel is on a weekend, the keys must be picked up prior to 5:00 p.m. on Friday. The van is located in Parking Lot H on the North side of Werner University Center. All fines or traffic violations incurred by drivers of the van. University funds may not be used for payment of fines/violations. Vehicle damages resulting from abuse, neglect, or the driver’s intentional action. Vehicle damages in the event of unauthorized use. Costs relating to other-than-normal vehicle expenses including towing charges, vehicle damage, and accessory installations and removals (radios, etc.). Cleaning accumulated food, paper, etc. left by users, including detailing, if necessary. Payment of any deductible associated with an employee’s accident that occurred while driving the van. If your plans change and you need to cancel a reservation, please call 503-838-8221 or email studentaffairs@wou.edu to notify the Office of the Vice President for Student Affairs. Cancellations made with less than 24-hour notice may be charged the full rental rate. The WOLF Ride program is operated by the Office of the Vice President for Student Affairs and is funded by the Incidental Fee.